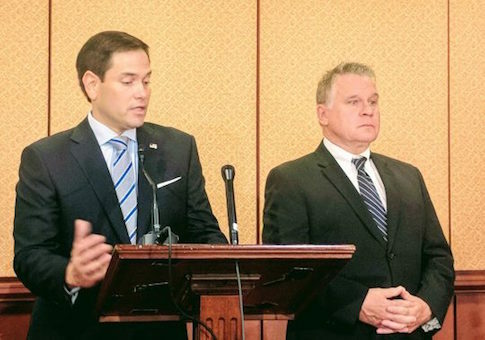 Senator Marco Rubio (R., Fla.) and Congressman Christopher Smith (R., N.J.) condemned the "unconscionable" persecution of religious minorities in China during a press conference Wednesday. The remarks followed the release of the Congressional-Executive Commission on China's annual report. Rubio and Smith are chairman and co-chairman of the committee. Rubio and Smith said the Chinese government is targeting Christians, Muslims, and ethnic minorities in unprecedented ways. "If ever there was a time to get serious," Smith said, this would be it. "This has to be the pivot point." He and Rubio noted that the report is exceptionally "comprehensive" in its recommendations. "We have an action plan. It's a good one." The report found that the Chinese government currently holds dozens of journalists prisoner, and exponentially more of their family members as punishment for their reporting. Smith and Rubio recognized several journalists and human rights activists in attendance whose families had been taken into custody or sent to camps. Some were taken from their homes as reprisal for their relatives' comments critical of the Chinese government. According to the report, the Chinese government's treatment of minorities is on a "continued downward trajectory." It notes there are "more than 1,300 active cases of political and religious prisoners contained in the Commission’s far from exhaustive Political Prisoner Database." Smith and Rubio stressed that their quarrel lay not with the Chinese people, but with the government. "This is about the Communist Party," Rubio said. "We are in solidarity with the Chinese people," Smith said in response to a question. The report stresses the unprecedented scale of Chinese repression against civil liberties. "Of particular concern is the mass, arbitrary, internment of as many as 1 million or more Uyghurs and other Muslim ethnic minorities in ‘political reeducation' camps in western China." This would make the Chinese government responsible for the "largest incarceration of an ethnic minority population since World War II, and that it may constitute crimes against humanity." Rubio and Smith insisted on clear and decisive actions by the Trump administration, which they expected would be supportive of the commission's recommendations. "When you kowtow, you enable dictatorship," Smith said. Smith noted that Trump's warm relations with foreign leaders presented an opportunity to improve the situation for their citizens. "Friends don’t let friends commit human rights abuses," Smith said. The two emphasized the report's steps for accountability, including through trade and other avenues. "I care about trade, but not at the expense of fundamental human rights," Smith said. "Get the human rights part right, and the friendship and the dialogue will accelerate." Rather than "stove-piping" economics and human rights as separate issues, the American government should use its full resources to pursue its interests, he said. In particular, they singled out the 2022 Winter Olympics, slated to be held in Beijing. If the human rights situation did not improve, they warned, the Olympics should be hosted elsewhere. They called the prospect of China hosting the Olympics while putting hundreds of thousands of innocent civilians in reeducation camps "unconscionable." The two sent a letter to FBI Director Christopher Wray Wednesday morning, asking about the "threats, harassment, and intimidation by the Chinese government" against Americans with ties to the region. They asked for the FBI to assist in "counter[ing] brazen Chinese government threats and influence operations on American soil." They pointed to Yahoo’s release of personal info that resulted in a dissident being jailed. They also highlighted to Apple's agreement to transfer data and likely disclose user information to Chinese authorities in an earlier incident. The report found that the Chinese government has spent billions producing technology to monitor citizen’s movements, whether they are praying, and their "social credit score." Earlier this week, Sen. Tom Cotton (R., Ark.) faulted Google for "entertaining the authoritarian demands of the Chinese Communist Party." As reported earlier this week, the critique is a reference to reports Google has been working on a project, codenamed Dragonfly, with China’s authoritarian government to produce a censored search engine that the Chinese government would approve for use in its country. This entry was posted in National Security and tagged China, Christopher Smith, Human Rights, Marco Rubio. Bookmark the permalink.